Access Profiles, Inc.: Are You Ready to Make a Difference? How Pope Francis Inspired Me in My Small Business! Our Focus is Your Business! Are You Ready to Make a Difference? 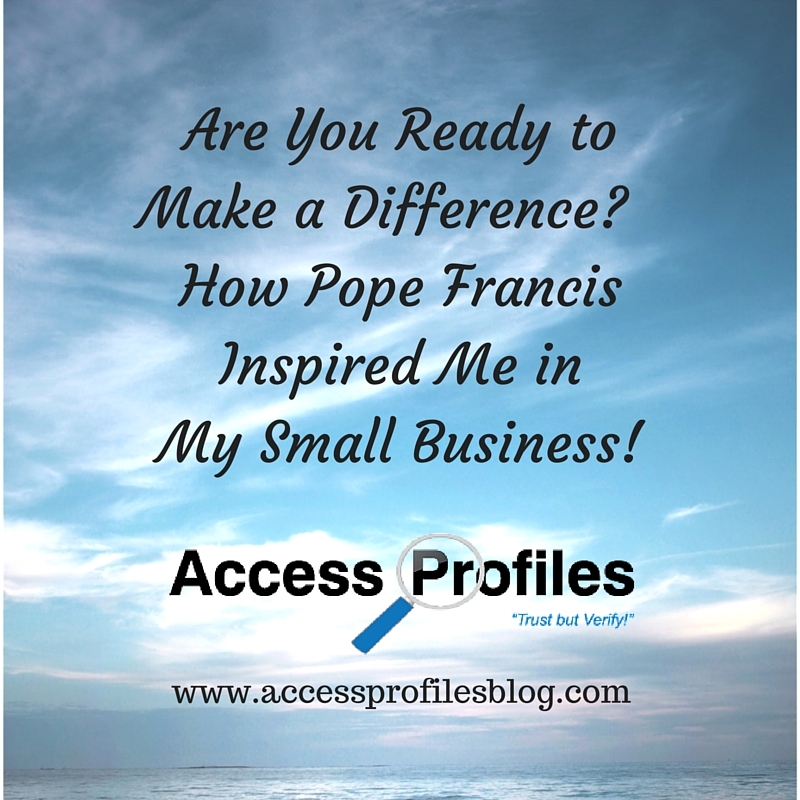 How Pope Francis Inspired Me in My Small Business! Each year, one Saturday in October is celebrated as “Make A Difference Day”. It is a time to really think about what we can do both as individuals and as a country to make a positive change to the people and to the world around us. And I believe that inspiration on what we can do can come from anywhere. This year, I found it in Pope Francis‘ visit to the United States. You would have to have been completely off the grid to be unaware of Pope Francis’ every move while he was in the U.S..
Not only was his visit covered extensively in the media (updates on the Pope’s progress filled every channel) but it was a shared topic of conversation among many. The outpouring of positive support for the Pope and his message carried across people of mixed denominations, races, and classes. His words became a shining example of what it means to come together as a people. Pope Francis shared his views on issues such as immigration, the environment, and religious freedom. He encouraged both liberal and conservatives to find common ground and work for the good of all. The Pope also spoke of the importance and role of businesses in promoting change. He stressed a focus on carefully using our natural resources and our growing technology to keep the spirit of entrepreneurship alive. In his own words, Pope Francis believes in Business as “a noble vocation, directed to producing wealth and improving the world”. He also addressed the selling of weapons to those intent on terrorizing others, “Why are deadly weapons being sold to those who plan to inflict untold suffering on individuals and society? Sadly, the answer, as we all know, is simply for money”. 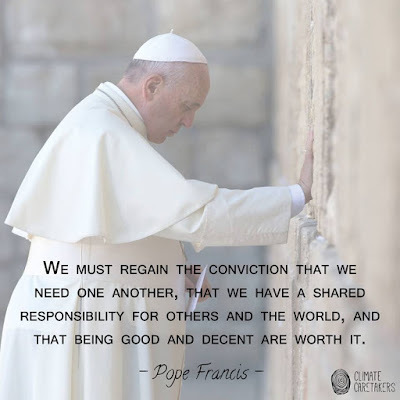 Pope Francis calls for all of us, individuals and companies, to move beyond a focus on profit at any cost and think about what we are doing and the impact it will have on the world. And even weeks later, his message has left me with a calling of my own to try and Make a Difference. Especially when it comes to using my own Small Business! The changes I make do not have to be on a global level. Instead, I choose to focus on doing things that can make a difference in my own community, to my clients, and to my company. In my community, I can make a pledge to “Shop Small” whenever possible. I can volunteer my time and my company to help other small businesses and non-profits in my area. And I can make sure that I run my business with integrity, making sure to give my very best to my clients. I can vow to not fall into the trap of making decisions solely based on the bottom line. While making a profit is of course necessary for any small business, it doesn’t have to be my ultimate goal. Instead, I can carefully choose what I do so that first and foremost, it will make a difference. I can treat others with respect. And although this quote focuses on employees, I believe it can pertain to everyone we come in contact with. Keeping it in mind, I can approach others with the faith that we are all worthy. And that we are all capable of facilitating change. I can do what I can to use my Small Business to truly Make a Difference and Pay it Forward to those around me. By helping other small business owners through my services and offering my support where needed, I am able to achieve this goal. I have found that the “greatest way to realize success myself is to help others achieve theirs”! Read more about my thoughts on how you can use your Small Business to create a “Pay it Forward Cycle of Success”! As Small Businesses, I believe we have the power to enact change. 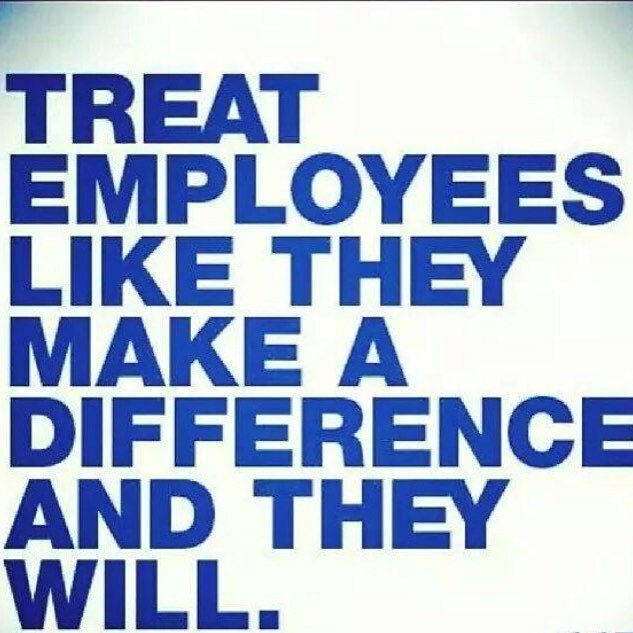 We can dedicate ourselves to it within our own company, and we can band together to promote change on a larger level. Needless to say, while I believed in this concept before, Pope Francis’ visit really touched a nerve. As individuals we may feel we can’t do enough to really promote change, but that is not true. What it does take is many individuals doing the absolute best they can. And as more of us take up this challenge, we can change our world. “The challenges facing us today call for a renewal of that spirit of cooperation, which has accomplished so much good throughout the history of the United States. The complexity, the gravity and the urgency of these challenges demand that we pool our resources and talents, and resolve to support one another, with respect for our differences and our convictions of conscience”. I believe We can Do it! Are You Ready to Make a Difference? Please Pay it Forward and Share! Leave a comment too. I would love to hear from you! Find out more about what I do to Pay it Forward on my About Me and Services pages! I invite you to subscribe to my blog for free Small Business Tips and News! Let's Connect! Contact Me for links to all my social sites. Thanks! Thanks for visiting our website. Contact Us! We can answer your questions and offer you a consultation on how we can help You with your Hiring, Business, and Security Needs! We also invite you to Subscribe. Just leave your email and you will get one new article each month with tips and information focused on You and Your Business! Thanks for taking the time to visit our website. Be sure to Subscribe for new articles with tips & information to help You and Your Business Succeed! Contact Us! We can Answer Your Business, Hiring, and Security Questions! Get Started Now ~ Subscribe Here! Can't Find What You are Looking for? Search This Blog! The "Soft" Skills You Need to Look for in Your New Hires! Do You have what it Takes to be a Good Leader? 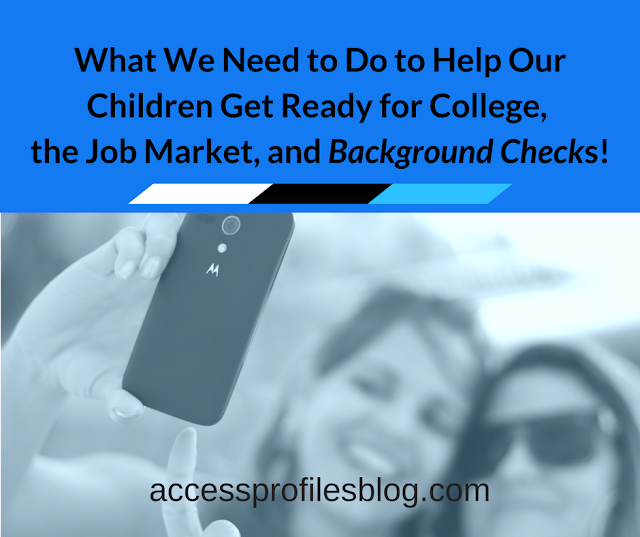 Isn't a Background Check Just a Way to Breach Your Privacy! It’s Earth Day! What can You Do to Help Save Our Planet? We are Here to Work for You! 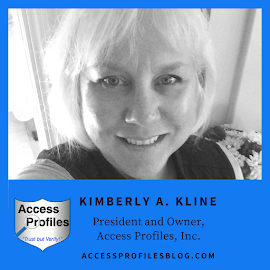 Access Profiles, Inc. (Kimberly Kline). Simple theme. Powered by Blogger.